Active in every genre other than opera, Czerny is now remembered largely for the numerous piano studies he wrote as pedagogical aids. 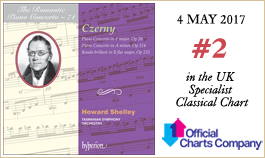 Which makes Howard Shelley’s advocacy of the three virtuoso works for piano and orchestra recorded here, two of them for the first time, all the more welcome: this is music which cannot fail to appeal. Few pianists will be unfamiliar with the name of Carl Czerny. At some point they will almost certainly have encountered at least one of his myriad studies; some might know that their author had the distinction of being the pupil of Beethoven and the teacher of Liszt. Beyond that, though—what? The average music-lover knows nothing of him beyond the fact that he wrote an extraordinary amount of pedagogical keyboard music. It is rare indeed to hear any piece by Czerny played in concert. Moreover, only a tiny proportion has ever been recorded. Pianophiles will know Vladimir Horowitz’s 1944 recording of the Variations on a theme by Rode ‘La Ricordanza’, Op 33 (the pianist’s favourite of all his recordings), and, perhaps, the variation Czerny was invited to contribute to Liszt’s Hexaméron along with Chopin, Thalberg, Pixis and Herz. Such random nuggets excepted, the familiar name of Czerny will provoke a collective blank. And what of the man? Joseph Kriehuber’s 1833 lithograph (on the cover of this booklet) puts one in mind of a less chubby Schubert. He was born in Vienna on 21 February 1791 (though Austrian by birth he was of Czech extraction: ‘Czerny’ in Czech means ‘black’). His father, Wenzel Czerny, was a gifted musician and strict disciplinarian. Work and no play was the order of the day: Carl was never allowed to play with other children, a regime that paid off when a violinist friend, Wenzel Krumpholz, took the young boy to play for Beethoven. The great composer taught Carl for three years. Lessons from Hummel and Clementi completed his studies, by which time Czerny had already earned a reputation himself for being a patient and diligent teacher. In 1804 he made plans for a tour of Europe as a piano virtuoso (Beethoven provided a flattering testimonial) but the state of the Continent obliged him to abandon the tour, and also the idea of becoming a peripatetic concert pianist. He never played in public after this date. Indeed, apart from three trips—to Leipzig (1836), Paris and London (1837), and Lombardy (1846)—he remained in Vienna for the rest of his life, eschewing fashionable society and, it appears, more interested in promoting Beethoven’s music than his own. Czerny’s devotion to his art was total. He never married (though he did allow himself to fall in love). He simply taught and composed for all the hours God gave him. His pupils included Thalberg, Theodor Kullak, Döhler and, as has been noted, Franz Liszt who was just ten years old when he took up residence in Czerny’s house (Czerny taught him for no fee). Later came Theodor Leschetizky, thus the same man trained the two most important piano teachers of the nineteenth century. Whilst cramming as many as ten or twelve lessons into a single day, Czerny managed somehow to write an enormous amount of music. His publishers could not get enough of it. Frequently he was forced to compose at night. His total of 861 opus numbers hides the fact that many of them contain numerous individual movements. For example, Op 261 has ‘125 Exercises’, Op 820 ‘90 Daily Studies’, and Op 821 ‘160 Short Studies’. He tackled every genre except opera—sonatas, concertos, string quartets, Masses and hymns flowed from his pen; symphonies, overtures, requiems, oratorios, pieces for three pianists playing six-hands on a single keyboard; and arrangements of operas which included the overtures to Semiramide and William Tell transcribed for sixteen pianists playing four-hands on eight pianos. For more than a century it has been acceptable to sneer at the fruits of such incredible industry, at this ability to turn out music with such fluency. John Field, Czerny’s contemporary and the inventor of the piano nocturne, described him as a Tintenfass—an inkpot. In 1845, a London concert manager named John Ella visited Czerny’s house in Vienna and observed how the composer operated: four music desks were set up in his studio. On each was a different composition in the process of being completed. Czerny would work on one to the bottom of the page then move to the next composition to do the same, so that by the time he had finished the bottom of the page on the fourth desk, the ink on the first page was dry. This could then be turned and composition could proceed. Such fluency and over-production allowed his many inspired and good works to be overshadowed by a greater number of lesser works. Those on this album alone demonstrate forcibly a man with a light touch and a sense of humour alongside a musician of supreme skill as a keyboard writer and orchestrator, someone quite removed from the image we might have of the severe, pedantic pedagogue. He was, we learn from Czerny’s acquaintance the Viennese musicologist Ferdinand Pohl, ‘modest and simple in his manner of life, courteous and friendly in his behaviour, just and kindly in his judgement on matters of art, and helpful to all young artists who came his way’. When he died on 15 July 1857, having no brothers, sisters or any close relations, Czerny assigned part of his considerable fortune to an institution for deaf-mutes. But if much of Czerny’s output was production-line stuff, there are almost always original touches or surprising elements involved somewhere. For instance, when the opening movement of the Piano Concerto in F major, Op 28, is marked allegro maestoso one expects it to begin with a forceful orchestral tutti—not with two pianissimo pizzicato crotchets in the strings echoed by the timpani. When the piano makes its first entry some three minutes later it is with the same muted martial material. After a mere twelve bars comes another unusual feature: a brief cadenza (presto). This leads to the first of many passages to keep the soloist on the qui vive which is followed at 5'10" by a second longer cadenza (prestissimo). A tutti at 7'16" offers the soloist the first respite. 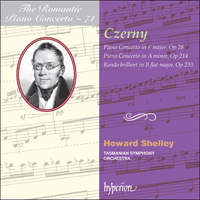 A third cadenza at 10'44" leads to a return to the home key and the initial subject, thence to some scintillating pages in which Czerny, doubtless, assumes his pianist to be well acquainted with many of his books of studies. Guitar aficionados may by now be thinking that the work sounds surprisingly familiar, and indeed the work enjoys an alternative incarnation as the Guitar Concerto No 3, Op 70, by Mauro Giuliani. An anonymous writer in The Musical World of 17 November 1837 clearly believed that the Giuliani came first, and that Czerny arranged the entire guitar concerto as an act of hommage ('And here we will bring no less a testimony than Czerny, the celebrated piano forte player, who, in his great admiration of one of Giuliani’s concertos, has actually written the whole piece for the piano forte …'), but on what authority is not known. Both works would have been written around the same time, and early—but undated—publications are inconclusive. Both in their different ways demonstrate effective and idiomatic writing for their respective soloists, which is how both may best be enjoyed. After the first movement’s rousing conclusion, the second offers a contrast with a simple air and variations in C major in the lilting 6/8 metre of the siciliana. The lively first variation (1'30") is completed by the orchestra alone and introduces a second variation (più lento) in C minor (one wonders if the young Chopin knew these pages). Variation 3 (4'12") is marked vivace e brillante. Here Czerny asks the soloist to play con fuoco before the movement’s distinctive ending: a gradual morendo, a sudden solitary fortissimo quaver tutti and a final sustained pianissimo chord from the two horns, bassoons and single flute. The finale is a polonaise of the kind that puts one in mind of Weber but without, perhaps, his melodic appeal. Czerny, it seems, is more interested in dazzling his audience and challenging his soloist to ever greater heights of prestidigitation. It is difficult not to conclude in such passages that Giuliani’s guitar is put at an impossible disadvantage. There are several other Rondos brillants among Czerny’s 861 opus numbers (in fact a Rondeau brillante à quatre mains from 1818 was his second published work) but no one is certain when the Rondo brillant in B flat major, Op 233, was written. His Op 289 piano trio in A minor was published in 1834, so presumably it dates from between the A minor concerto and then. The format is conventional enough with a solemn introduzione (adagio) in B flat minor and its relative major. Increasingly agitated figures lead to a presto solo cadenza and thence to the main body of the piece. The rondo, like the finale of the A minor concerto, is in a jaunty 2/4 measure but marked allegro con garbo (‘gracefully’). Many devices and challenges similar to those encountered in the concerto present an equally fearsome test for the pianist, though the orchestra’s contribution is far less significant. Czerny may not be the greatest melodist, but as a probing examiner of every aspect of the pianist’s skill he had few rivals. Rares sont les pianistes qui ignorent le nom de Carl Czerny. Il est pratiquement certain qu’à un moment ou à un autre, ils auront au moins été confrontés à l’une de ses innombrables études; certains savent peut-être que leur auteur eut le privilège d’être un élève de Beethoven et le professeur de Liszt. Mais quoi d’autre en dehors de cela? Le mélomane moyen ignore tout de lui, sinon qu’il a écrit une incroyable quantité de musique pédagogique pour clavier. En fait, on entend rarement jouer un morceau de Czerny en concert. En outre, seule une très faible proportion de sa musique a fait l’objet d’enregistrements. Les amateurs de piano connaissent l’enregistrement des Variations sur un thème de Rode «La Ricordanza», op.33, réalisé par Vladimir Horowitz en 1944 (celui qu’il préférait parmi tous ses enregistrements) et, peut-être, la variation que Czerny fut invité à écrire pour l’Hexaméron de Liszt conjointement avec Chopin, Thalberg, Pixis et Herz. À l’exception de ce genre de pépites prises au hasard, le nom bien connu de Czerny n’évoque strictement rien. Et qu’en est-il de l’homme? La lithographie qu’en fit Joseph Kriehuber en 1833 (sur la couverture de ce livret) fait penser à Schubert en moins potelé. Il naquit à Vienne, le 21 février 1791 (même s’il était Autrichien de naissance, il était d’origine tchèque: «Czerny» en tchèque signifie «noir»). Son père, Wenzel Czerny, était un musicien de talent et une personne très stricte en matière de discipline. Du travail, pas de jeu, tel était le programme—Carl n’avait jamais le droit de jouer avec d’autres enfants, un régime qui s’avéra payant lorsqu’un ami violoniste, Wenzel Krumpholz, emmena le jeune garçon jouer devant Beethoven. Le grand compositeur prodigua son enseignement à Carl pendant trois ans. Des leçons de Hummel et de Clementi complétèrent sa formation et, à cette époque, Czerny s’était déjà forgé une réputation de professeur patient et appliqué. En 1804, il envisagea de faire une tournée comme pianiste (Beethoven lui fournit une lettre de recommandation flatteuse), mais l’état de l’Europe l’obligea à y renoncer—ainsi qu’à l’idée de devenir un pianiste concertiste itinérant. Il ne joua jamais en public après cette date. En fait, en dehors de trois voyages—à Leipzig (1836), Paris et Londres (1837), ainsi qu’en Lombardie (1846)—il resta à Vienne jusqu’à la fin de ses jours, ne se mêla jamais au beau monde et s’intéressa, semble-t-il, davantage à la promotion de la musique de Beethoven que de la sienne. Le profond attachement de Czerny à son art fut total. Il ne se maria jamais (même s’il s’autorisa à tomber amoureux). Il consacra simplement à l’enseignement et à la composition toutes les minutes que Dieu lui donna. Au nombre de ses élèves figuraient Thalberg, Theodor Kullak, Döhler et, comme on l’a noté, Franz Liszt qui n’avait que dix ans quand il élut domicile chez Czerny (celui-ci lui prodigua gratuitement son enseignement). Vint ensuite Theodor Leschetizky; c’est donc le même homme qui forma les deux pédagogues du piano les plus importants du XIXe siècle. Tout en accumulant jusqu’à dix ou douze leçons par jour, Czerny réussit néanmoins à écrire une somme considérable de musique. Ses éditeurs n’en avaient jamais assez. Il était souvent obligé de composer la nuit. Le total de 861 numéros d’opus cache le fait qu’un grand nombre d’entre eux contiennent plusieurs mouvements séparés. Par exemple, l’op.261 comporte «125 Exercices», l’op.820 «90 Études quotidiennes» et l’op.821 «160 Petites études». Il aborda tous les genres à l’exception de l’opéra—des sonates, des concertos, des quatuors à cordes, des messes et des hymnes coulaient à flots de sa plume; des symphonies, des ouvertures, des requiems, des oratorios, des morceaux pour trois pianistes jouant à six mains sur un seul clavier; et des arrangements d’opéras, notamment les ouvertures de Sémiramide et de Guillaume Tell transcrites pour seize pianistes jouant à quatre mains sur huit pianos. Pendant plus d’un siècle, on tournait volontiers en ridicule un zèle aussi incroyable, cette aptitude à produire de la musique avec une telle aisance. John Field, contemporain de Czerny et inventeur du nocturne pour piano, le décrivit comme un Tintenfass—un encrier. En 1845, un organisateur de concerts londonien nommé John Ella se rendit chez Czerny à Vienne et observa comment fonctionnait le compositeur: quatre pupitres étaient installés dans son studio. Sur chacun d’entre eux il y avait une composition différente en cours d’achèvement. Czerny travaillait à l’une d’entre elles jusqu’au bas de la page puis passait à l’œuvre suivante pour faire la même chose; ainsi, lorsqu’il était arrivé au bas de la page sur le quatrième pupitre, l’encre de la première page était sèche. Il pouvait donc la tourner et la composition pouvait avancer. En raison d’une telle facilité et d’une telle surproduction, un grand nombre de ses œuvres originales et de qualité furent éclipsées par une quantité encore plus importante d’œuvres mineures. Celles qui sont enregistrées dans cet album sont révélatrices, à elles seules et sans le moindre doute, d’un homme à la touche légère et plein d’humour aussi bien que d’un musicien passé maître dans l’art d’écrire pour le clavier et pour l’orchestre, une image très éloignée de celle que l’on pourrait avoir du pédagogue sévère et pédant. Grâce au témoignage du musicologue viennois Ferdinand Pohl, une connaissance de Czerny, on sait qu’il était «modeste et simple dans son mode de vie, courtois et amical dans son comportement, juste et bienveillant dans son jugement sur les questions artistiques, et obligeant avec tous les jeunes artistes qui se présentaient à lui». À sa mort, le 15 juillet 1857, comme il n’avait ni frère, ni sœur, ni parents proches, Czerny céda une partie de sa fortune considérable à une institution pour sourds-muets. Mais si une grande partie de sa production était produite à la chaîne, il y a presque toujours quelque part des touches originales ou des éléments surprenants. Par exemple, lorsque le premier mouvement du Concerto pour piano en fa majeur, op.28, est marqué allegro maestoso, on s’attend à ce qu’il commence par un tutti orchestral vigoureux—pas par deux noires pizzicato pianissimo des cordes reprises en écho par les timbales. Quand le piano fait sa première entrée environ trois minutes plus tard, c’est avec le même matériel martial en sourdine. Après douze mesures seulement vient une autre particularité inhabituelle: une courte cadence (presto). Celle-ci mène au premier des nombreux passages destinés à garder le soliste sur le qui-vive, suivi à 5'10" d’une deuxième cadence plus longue (prestissimo). Un tutti à 7'16" procure au soliste le premier répit. Une troisième cadence à 10'44" mène à un retour vers la tonalité d’origine et au sujet initial puis, de là, à quelques pages brillantes dans lesquelles Czerny suppose sans aucun doute que son pianiste connaît bien un certain nombre de ses recueils d’études. Après la conclusion exaltante du premier mouvement, le deuxième présente un contraste avec un air simple et des variations en ut majeur sur le rythme mélodieux de la sicilienne. La première variation pleine d’entrain (1'30") est complétée par l’orchestre seul et mène à une deuxième variation (più lento) en ut mineur (on se demande si le jeune Chopin connaissait ces pages). La troisième variation (4'12") est marquée vivace e brillante. Ici, Czerny demande au soliste de jouer con fuoco avant la véritable fin du mouvement: un morendo progressif, un soudain tutti isolé en croches fortissimo et un accord final des deux cors, des bassons et d’une seule flûte tenu pianissimo. Le finale est une polonaise qui fait penser à Weber mais, peut-être, sans son charme mélodique. Il semble que Czerny cherche davantage à éblouir son auditoire et à stimuler son soliste pour qu’il aille toujours plus loin dans la prestidigitation. Il y a plusieurs autres Rondos brillants dans les 861 numéros d’opus de Czerny (en fait, un Rondeau brillante à quatre mains de 1818 fut sa deuxième œuvre publiée), mais personne n’est sûr de la date à laquelle fut écrit le Rondo brillant en si bémol majeur, op.233. Son trio avec piano en la mineur, op.289, fut publié en 1834 et il se situe donc sans doute entre le concerto en la mineur et ce moment-là. Le format est assez conventionnel avec une introduzione solennelle (adagio) en si bémol mineur et son relatif majeur. Des figures de plus en plus agitées mènent à une cadence presto en solo, puis au corps principal de la pièce. Le rondo, comme le finale du concerto en la mineur, est enjoué mais marqué allegro con garbo («avec grâce»). De nombreux procédés et défis analogues à ceux rencontrés dans le concerto constituent une épreuve tout aussi redoutable pour le pianiste, bien que la contribution de l’orchestre soit beaucoup moins importante. Czerny n’est peut-être pas le plus grand mélodiste, mais en ce qui concerne l’appréciation des différents aspects du talent d’un pianiste, il a peu de rivaux à son époque. Wohl kaum einem Pianisten wird der Name Carl Czerny nicht geläufig sein. Man kann mit einiger Sicherheit davon ausgehen, dass jeder Klavierspieler zu dem einen oder anderen Zeitpunkt mit mindestens einer seiner unzähligen Etüden in Kontakt gekommen ist, und einigen mag bewusst sein, dass Czerny sich dadurch auszeichnete, Schüler von Beethoven und Lehrer von Liszt gewesen zu sein. Davon abgesehen jedoch? Der durchschnittliche Musikliebhaber weiß nichts über Czerny, außer vielleicht, dass er eine außergewöhnliche Menge an didaktischen Klavierstücken geschrieben hat. Es kommt nur sehr selten vor, dass ein Werk von Czerny im Konzertsaal gegeben wird, und eingespielt wurde bisher lediglich ein kleiner Bruchteil. Klavierliebhabern wird die Aufnahme der Variationen auf ein Thema von Rode „La Ricordanza“, op. 33, von Vladimir Horowitz aus dem Jahr 1944 bekannt sein (die Lieblingsplatte des Pianisten aus seiner Diskographie), sowie vielleicht die Variation, die Czerny zu Liszts Hexaméron beisteuerte—ein Gemeinschaftswerk, zu dessen Gelingen auch Chopin, Thalberg, Pixis und Herz eingeladen worden waren. Von derart zufälligen Bröckchen allerdings abgesehen, wird der bekannte Name Czerny allgemeine Ratlosigkeit auslösen. Was lässt sich über seine Person sagen? Die Lithographie von Joseph Kriehuber von 1833 (auf der Titelseite dieses Booklets) erinnert an Schubert, wenn auch Czerny weniger pausbäckig ist. Er wurde am 21. Februar 1791 in Wien geboren und seine Eltern waren tschechischer Abstammung („Czerny“ bedeutet „schwarz“ im Tschechischen). Sein Vater, Wenzel Czerny, war ein begabter Musiker, der auf eiserne Disziplin Wert legte. Arbeit, und kein Vergnügen, stand auf der Tagesordnung—Carl durfte nie mit anderen Kindern spielen. Dieser Drill machte sich bezahlt, als ein befreundeter Geiger, Wenzel Krumpholz, den Jungen Beethoven vorstellte und ihn vorspielen ließ. Der große Komponist unterrichtete Carl drei Jahre lang. Stunden bei Hummel und Clementi rundeten seine Ausbildung ab, und bald hatte sich Czerny selbst einen Ruf als geduldiger und gewissenhafter Lehrer erarbeitet. 1804 schmiedete er Pläne für eine Konzertreise durch Europa als Klaviervirtuose; Beethoven hatte ihm eine schmeichelhafte Empfehlung geschrieben. Aufgrund der Napoleonischen Kriege musste er von dem Vorhaben jedoch Abstand nehmen—und gleichzeitig von der Absicht, sich als umherreisender Virtuose den Lebensunterhalt zu verdienen. Darauf trat er nie wieder öffentlich auf. Und mit Ausnahme von drei Reisen—nach Leipzig (1836), Paris und London (1837) und in die Lombardei (1846)—blieb er für den Rest seines Lebens in Wien, bewegte sich nie in modischer Gesellschaft und hatte offenbar größeres Interesse daran, sich für die Musik Beethovens einzusetzen, als seine eigene voranzutreiben. Czerny widmete sich völlig seiner Kunst. Er heiratete nie (obwohl er es sich erlaubte, sich zu verlieben). Er verwendete seine Zeit fast ausschließlich darauf, zu unterrichten und zu komponieren. Zu seinen Schülern zählten Thalberg, Theodor Kullak, Döhler und, wie bereits erwähnt, Franz Liszt, der gerade einmal 10 Jahre alt war, als er bei Czerny untergebracht wurde (Czerny unterrichtete ihn für umsonst). Später kam noch Theodor Leschetizky dazu, so dass derselbe Mann die beiden bedeutendsten Klavierpädagogen des 19. Jahrhunderts ausbildete. Während Czerny zehn oder sogar zwölf Klavierstunden am Tag gab, gelang es ihm immer noch, eine riesige Anzahl an Werken zu schreiben, und seine Verleger konnten nicht genug davon bekommen. Oft musste er nachts komponieren. Die Gesamtzahl seiner Opera—861—verbirgt die Tatsache, dass viele davon etliche Einzelsätze enthalten. So umfasst sein op. 261 beispielsweise „125 Passagenübungen“, op. 820 „90 Tägliche Übungen“ und op. 821 „160 Kurze Übungen“. Bis auf die Oper setzte er sich mit allen Genres auseinander—Sonaten, Solokonzerte, Streichquartette, Messen und Kirchenlieder flossen aus seiner Feder, des Weiteren Symphonien, Ouvertüren, Requiems, Oratorien, Werke für drei Pianisten mit sechs Händen an einer Tastatur, sowie Opernbearbeitungen, darunter die Ouvertüren zu Semiramide und Wilhelm Tell arrangiert für sechzehn Pianisten, die jeweils vierhändig an acht Klavieren spielen. Über ein Jahrhundert lang ist es allgemein hingenommen worden, dass dieser unglaubliche Fleiß und die Gabe, Musik mit derartiger Leichtigkeit zu schreiben, verspottet wurde. John Field, ein Zeitgenosse Czernys und der Erfinder des Klavier-Nocturnes, bezeichnete ihn als „Tintenfass“. 1845 hielt sich ein Londoner Konzertveranstalter namens John Ella in Wien auf, besuchte Czerny und beobachtete die Arbeitsmethode des Komponisten: in seinem Atelier waren vier Tische aufgestellt, auf denen jeweils ein angefangenes Manuskript lag. Czerny arbeitete an einem, bis er unten auf der Seite angekommen war und fuhr dann am nächsten Tisch ebenso fort. Wenn er auf diese Weise am vierten Tisch die Seite fertig beschrieben hatte, war die Tinte auf der ersten Seite trocken, so dass er sie wenden und mit jener Komposition fortfahren konnte. Dieser Arbeitsfluss und diese enorme Produktivität führten dazu, dass viele seiner guten und originellen Kompositionen von der größeren Masse seiner durchschnittlicheren Werke überschattet wurden. Allein die hier vorliegenden Stücke demonstrieren eindrucksvoll einen einfühlsamen und humorvollen Menschen, der gleichzeitig ein äußerst talentierter Klavierkomponist und Orchestrierer war—weit entfernt von dem Image des strengen, pedantischen Pädagogen, das man möglicherweise hat. Der Wiener Musikwissenschaftler Ferdinand Pohl, der Czerny kannte, beschrieb Czerny folgendermaßen: „Im Aeußern höchst einfach und anspruchslos erscheinend, war er im Umgang stets freundlich und gefällig gegen Jedermann; sein Urtheil über Kunsterscheinungen war gerecht und nachsichtig, für junge Talente hatte er stets ein aufmunterndes Wort.“ Czerny starb am 15. Juli 1857 und hatte keine Anverwandten—einen Teil seines beträchtlichen Vermögens hatte er für eine Einrichtung für Taubstumme bestimmt. Wenn auch viel von Czernys Oeuvre serienmäßig anmutet, finden sich fast immer originelle Figuren oder überraschende Elemente. So etwa im Klavierkonzert F-Dur, op. 28, dessen erster Satz mit Allegro maestoso bezeichnet ist: hier würde man zu Beginn ein kraftvolles Orchestertutti erwarten, und nicht zwei Pizzicato-Viertel im Pianissimo von den Streichern, die dann von der Pauke wiederholt werden. Wenn das Klavier etwa drei Minuten später erstmals einsetzt, tut es das mit demselben gedämpften militärischen Material. Nach nur zwölf Takten folgt eine weitere ungewöhnliche Wendung: eine kurze Kadenz (Presto). Diese leitet in die erste von vielen Passagen hinein, die den Solisten auf dem Quivive halten, worauf sich bei 5'10 eine zweite, längere Kadenz (Prestissimo) anschließt. Ein Tutti bei 7'16 gewährt dem Solisten eine erste kurze Atempause. Eine dritte Kadenz bei 10'44 bringt die Rückkehr der Grundtonart und des ersten Themas mit sich, woraufhin mehrere brillante Passagen folgen, bei denen Czerny sicherlich davon ausgeht, dass der Pianist mit seinen vielen Etüden vertraut ist. Nach dem überschwänglichen Ende des ersten Satzes sorgt der zweite mit einem schlichten Thema und Variationen in C-Dur im schwingenden 6/8-Siziliano für Kontrast. Die lebhafte erste Variation (1'30) wird vom Orchester allein gespielt und leitet die zweite Variation (Più lento) in c-Moll ein—man fragt sich dabei, ob der junge Chopin diese Musik wohl gekannt hat. Variation 3 (4'12) ist mit Vivace e brillante überschrieben. Hier weist Czerny seinen Solisten an, con fuoco zu spielen, bevor der Satz in charakteristischer Weise zu Ende geht: ein allmähliches Morendo, eine plötzliche alleinstehende Tutti-Achtel im Fortissimo und ein ausgehaltener Schlussakkord im Pianissimo von den beiden Hörnern, Fagotten und einer einzelnen Flöte. Das Finale ist eine Polonaise, die an Weber erinnert, jedoch vielleicht ohne dessen melodischen Reiz. Czerny war offenbar eher daran interessiert, sein Publikum zu überwältigen und seinen Solisten zu immer höheren Gipfeln der Fingerfertigkeit anzuspornen. Unter den 861 Opuszahlen Czernys finden sich mehrere Rondos brillants (ein Rondeau brillante à quatre mains von 1818 war sogar sein zweites veröffentlichtes Werk), doch lässt sich nicht feststellen, wann das Rondo brillant B-Dur, op. 233, entstand. Sein Klaviertrio a-Moll, op. 289, wurde 1834 veröffentlicht, so dass man annehmen darf, dass es zwischen dem Klavierkonzert a-Moll und eben jenem Klaviertrio entstand. Die Anlage ist recht konventionell; die getragene Einleitung (Adagio) steht in b-Moll sowie der parallelen Durtonart. Zunehmend bewegte Figuren leiten in eine Presto-Solokadenz und von dort aus in den Hauptteil des Stücks. Ebenso wie das Finale des a-Moll-Konzerts steht das Rondo in einem schwungvollen 2/4-Takt, ist jedoch als Allegro con garbo („elegant“) bezeichnet. Ähnlich wie im Klavierkonzert finden sich auch hier zahlreiche Stilmittel und Herausforderungen, die den Pianisten prüfen, doch in diesem Fall ist der Beitrag des Orchesters deutlich weniger beachtenswert. Czerny mag nicht der größte Melodiker sein, als forschender Prüfer aller Aspekte der pianistischen Kunstfertigkeit hat er jedoch zum jetzigen Zeitpunkt kaum Rivalen.